Silver is a chemical element. Its chemical symbol is Ag and atomic number is 47. Silver is a soft, shiny metal that is a good conductor of electricity. Silver is precious metal that has been used for many years to make fine pieces of jewelry, coins, utensils and various pieces of art. 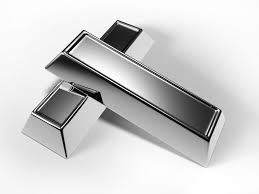 In modern times silver is also used in dentistry, electronics, photography, mirrors and in a number of industrial applications that make use of its unique properties. You may have heard of the term sterling sliver, this is the name given to an alloy (combination of metals) that is at least 92.5% silver by weight. The other 7.5% is made up of other metals, usually copper. Silver is found naturally by itself, as an alloy with gold or in an ore (a rock containing various metals and elements). Silver is often found in copper and lead ores. The price of silver has fluctuated dramatically over the last century, climbing as demand increases but dropping when large silver deposits are found. As of November 2009, gold was valued at around 65 times the value of silver by mass. The word silver is one of the few words in the English language that is nearly impossible to rhyme. Words such as orange, purple, breadth, wolf, depth, angst, gulf, ninth and twelfth are also difficult or impossible to rhyme. While there are some words that do actually rhyme with these examples they are usually very rare or hardly used in the modern English language. Silver's melting point is 1761 degrees F or 960 degrees C.